Palace Gardens seems to be one of the most unusual street names in Dublin. There are no gardens, as far as I can see, and there is no palace nearby – unless one considers the palace that may once have existed within the walls of Dublin, although that has long disappeared. But when I took a second look at it in the sunshine this afternoon, I realised that despite the harp on the name-sign, this is not an official street name. Palace Gardens is on the south side of Dame Street, facing onto a modern plaza opposite the Olympia Theatre and that was once graced with statues of the three graces but that are forgotten and long gone. The apartments are squeezed between Exchange Court, running along the east walls of City Hall, and Palace Street, which leads in Dublin Castle and which sometimes competes for the title of the shortest street in Dublin. In these days of bright early summer sunshine, the plaza in front of Palace Gardens is filled with tourists seeking shading resting place beneath the spreading trees, and chuggers who always seem to think I have time on my hand. Nearby are some of my favourite cafés, restaurants and restaurants, including Mykonos on Dame Street and Chez Max on Palace Street. I was on my way this afternoon [2 June 2016] to Christ Church Cathedral for Choral Evensong. I am the canon-in-residence this week, and read the two lessons at evensong, II Samuel 14: 1-11 and Acts 22: 6-21. The New Testament reading told of the Apostle Paul’s conversion on the road to Damascus and the persecutions of the Early Church in Jerusalem. It was appropriate then that the Precentor and Acting Dean, Canon Neil McEndoo, prayed for people who are suffering in Syria and the Middle East. According to the UN, more than 2,500 people had died this year trying to reach Europe by sea – a sharp increase from the same period last year. The risk of death on the central Mediterranean route between Libya and Italy is now one in 23, according to William Spindler of the UN refugee agency (UNHCR). About 204,000 migrants and refugees have crossed the Mediterranean since January, a figure that has also climbed acutely. The number is more than double the nearly 92,000 who landed on European shores during the first five months of 2015. Three-quarters of those who have arrived in Europe so far this year landed in Greece before the end of March – most of them refugees fleeing conflicts in Syria and Afghanistan. Counting all routes across the Mediterranean, William Spindler says the odds of dying while trying to cross to Europe are now one in 81. The route between Libya and Italy, which is far longer than the one between Turkey and Greece, is particularly deadly, with 2,119 of all deaths registered this year along that route. Nearly all of those travelling on this route are from sub-Saharan Africa, particularly Nigeria and Gambia, as well as Somalia and Eritrea. As the choir and clergy moved towards the west end of the cathedral at the end of Evensong, the evening sun was streaming through the west windows, and a prayed for a more enlightened and generous approach to refugees in Ireland and throughout Europe. We live in an island that is a palace and a world that is a garden, and we need to be more generous in our sharing and our understanding in what are dark days for so many people. 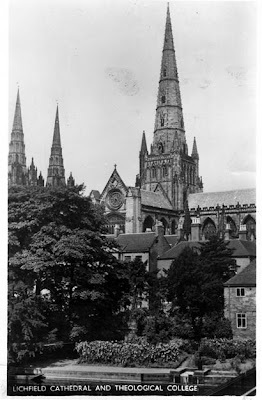 Over the past three mornings, I was writing about the poet Philip Larkin, his family connections with Lichfield, and three poems he wrote while he was staying with his family in Cherry Orchard, Lichfield, during Christmas 1940. However, another aspiring poet who lived in Lichfield less than a decade earlier would never blossom as poet despite the patronage, support and friendship of the greatest living poet of his day, TS Eliot. Geoffrey Curtis was a young priest when he arrived in Lichfield in 1932 at the age of 29 to take up an appointment as Vice-Principal of Lichfield Theological College. Some months earlier, he had sent manuscript copies of his poems to TS Eliot, and on 16 January 1932 he travelled from Lichfield to London hoping to meet TS Eliot at his offices with the publishers Faber and Faber. Eliot was not at his office when Curtis called, the meeting never took place, and Curtis left a note for Eliot asking him to write a note to the reader at the Student Christian Movement, encouraging him to read his poems, and asking him to write a preface if the poems were published by SCM. I understand that a volume of Devotional verse entitled ‘Lyra Subapostolica’ by a young friend of mine, the Reverend Geoffrey Curtis of Lichfield Theological College is likely to be sent to you with a view to publication. I trust that you will not take it as an impertinence on my part if I express the hope that the volume may receive favourable attention as I have been warmly interested in Father Curtis’s poetry for several years. As far as I can find out, Lyra Subapostolica was never published by SCM, although Curtis later published biographies or studies of William of Glasshampton (SPCK, 1947) and Abbé Paul Courturier (1964), and after Curtis left Lichfield he and Eliot remained lifelong friends. Eliot’s signed typescript letters to Curtis, spanning more than three decades from 1930 to 1964, are wide-ranging, touching on religion, poetry, writing, social engagements, professional obligations, travel plans and domestic matters, often delving into spiritual questions. The collection of about 76 letters from Eliot to Curtis is now in the Houghton Library at Harvard, and includes a letter dated 28 December 1953 enclosing an early, typescript (carbon) draft of Eliot’s poem The cultivation of Christmas trees. There are letters too to Curtis from the literary critic Frederick Wilse (Noel) Bateson (1901–1978), of Corpus Christi College, Oxford, and Mervyn Sweet. The Revd Geoffrey William Seymour Curtis CR (1902-1981) was born in 1902 and was educated at Charterhouse School (1915-1920) and University College, Oxford (BA, 1923), before training for ordination at Cuddesdon Theological College, Oxford, now Ripon College Cuddesdon. He was ordained deacon in 1925 for the parish of Saint Mary the Virgin, Bury, in the Diocese of Manchester, and was ordained priest in 1926 by Bishop (later Archbishop) William Temple. After Bury, he had a series of short appointments, including Vice-Principal, Dorchester Missionary College (1928-1930), and Missioner with the Charterhouse Mission at Saint Hugh’s, Bermondsey (1930-1932), before coming to Lichfield as Vice-Principal of Lichfield Theological College (1932-1933) and curate of the Staffordshire parish of Saint Mary’s, Blymhill. In 1935, Curtis joined the Community of the Resurrection as a novice and made his profession in 1938. Geoffrey Curtis was renowned as a spiritual director, and despite never gaining recognition as a poet, he remained a lifelong friend and spiritual confidante of TS Eliot. When Father Eric Cheetham retired from Saint Stephen’s, Gloucester Road, in 1956, Eliot was worried that the liturgical tradition of Saint Stephen’s might be upset by the new priest, Father Wilfred Jennings. He approached Curtis about the matter, and Curtis advised him to move to nearby Saint Mary Abbots in Kensington High Street. However, there were no significant changes under Father Jennings, and Eliot remained a churchwarden at Saint Stephen’s until 1959, and continued to worship there for the remaining decade of his life. Curtis was a founding figure in the International Ecumenical Fellowship (IEF). His work for ecumenism started with his early enthusiasm for the Carthusian martyrs, and brought him throughout Europe, East and West. His meetings with Pope Pius XII and the future Pope Paul VI may well have contributed to the thaw in Anglican-Roman Catholic relations which blossomed at the time of Vatican II (1962-1965). Geoffrey Curtis remained a vice-president the International Ecumenical Fellowship (IEF) almost until his death. In his dying days, he was nursed at the Royal Foundation of Saint Katharine, his last home, on earth by a devoted friend, Helen Gold, once a Jewish refugee from Hitler’s Germany. When he died in 1981, Geoffrey’s life was celebrated at Saint Katharine’s, where he died, and at All Hallows by the Tower, as well as at Mirfield, the mother house of the Community of the Resurrection. Meanwhile, Lichfield Theological College, where Curtis had once been the vice-principal, closed in 1972, and the trustees rented the Principal’s House and the college buildings to the trustees of Saint John’s Hospital. The college buildings, apart from the chapel, were demolished within a few years. In 1980, the college chapel was turned into an educational and social centre, known as the Refectory, and is now known as the College Hall. A new almshouse, Saint John’s Within the Close, was built on the rest of the site and opened in 1981. Today it houses up to 18 residents.